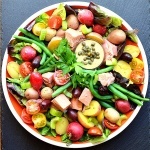 I have been wanting to create this Vegan Nicoise Salad for quite some time. After I discovered jackfruit, I knew it would be the perfect addition. I purchased the jackfruit packed in brine rather than water, so it already has a bit of flavor. The beauty of jackfruit is that it takes on the flavor of whatever you add to it. If you haven’t heard of it (or tried it before), I went into great detail in this post here and you can purchase it on Amazon here (it’s a little difficult to find in grocery stores). Obviously the original Nicoise contains ingredients that are not vegan-friendly, so I made a few substitutions. Instead of eggs, we have little creamer potatoes and the jackfruit instead of tuna. But don’t for one minute think that this salad isn’t full of flavor. The dressing is the classic Dijon and white wine vinegar-based standard you know and love. I like to toss the warm potatoes with the dressing and then serve the rest on the side. Every Nicoise salad has it’s variations and you can certainly switch up what you put in yours. In addition to the jackfruit pieces, my Vegan Nicoise Salad included blanched green beans, radishes, celery, Kalamata olives, creamer (or baby) potatoes that I steamed until fork tender. The smaller ones can stay whole, those that are a little bit larger I halved. I found multi-colored cherry tomatoes which I halved and finally, added just a few leaves of red and green butter lettuce to round things out. The dressing is simple. Minced shallot, capers (optional), Dijon mustard, white wine vinegar, salt and pepper are whisked as extra virgin olive oil is drizzled in. It takes just a minute or two for it to emulsify. As I mentioned above, I like to lightly dress just the warm potatoes and serve the rest on the side. This is purely for aesthetic purposes however. Be sure to taste for seasoning after dressing and add a bit more salt or pepper to adjust if necessary. Combine all of the ingredients for the dressing except the olive oil. While whisking, slowly drizzle the olive oil until it becomes emulsified. I don't measure salad ingredients, so using a handful of each, arrange the ingredients on each plate. The dressing should nicely serve about 4 people and lightly dress the salad. I do like to toss the warm potatoes with the dressing and give each plate a portion on the side. I prefer to dip into it as I go. Season with salt & pepper as necessary.